Recently, another "Intern Classroom Lesson" took place. I'm going to tell you what happened, with the help of a few crude drawings. I boarded at Hicksville, my usual station. The train car was virtually empty, and I had my pick of spots. As a creature of habit, I chose an aisle seat somewhere in the middle of the seating layout, for reasons I'll explain in a future post. 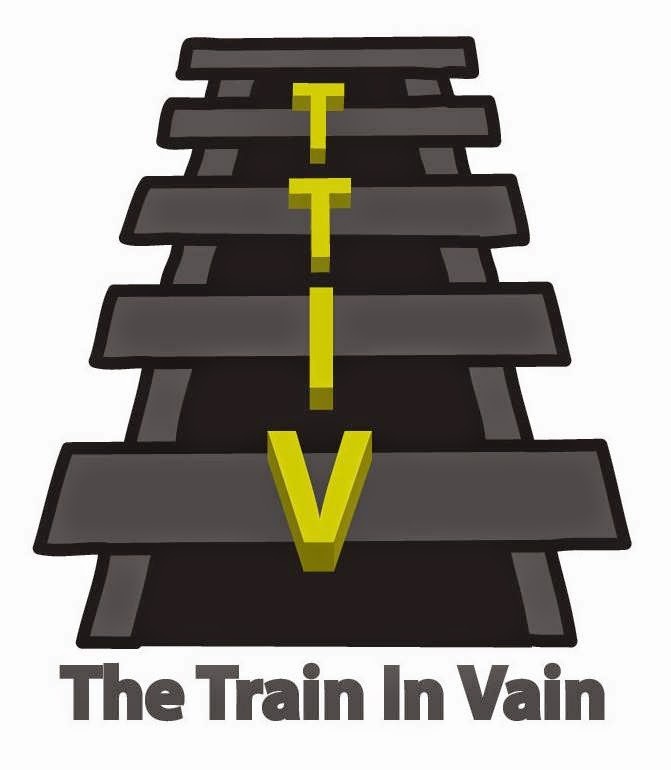 A young man boarded at the next stop, and was soon the recipient of some TTIV guidance. Exhibit A shows the basic seating configuration of a Long Island Rail Road train, and the scenario after I boarded. 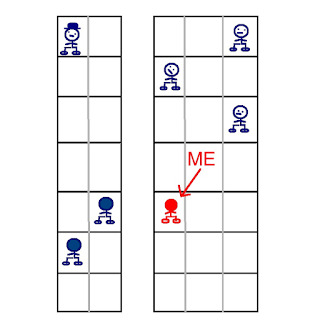 I'm the red guy. It was not crowded at all, but when we arrived at the next stop, many people got on. The empty seats were going to fill. In my aisle seat, I was prepared to stand up and let people sit by the window, and perhaps even the middle seat. Yes, I said the middle seat. Of course, I do everything in my power to make that middle seat unattractive. I know that's not nice, but it's self-preservation. My commute is a barometer of how my day will be. If the ride in is good, my morning will likely go smoothly. So making that middle seat unattractive is not just for personal satisfaction, it's for the betterment of my career. This may lead to better compensation, which will allow me to provide better opportunities for my children. And my children's children. Please stop! I can't handle the onslaught of Father of the Year nominations! You're too kind. 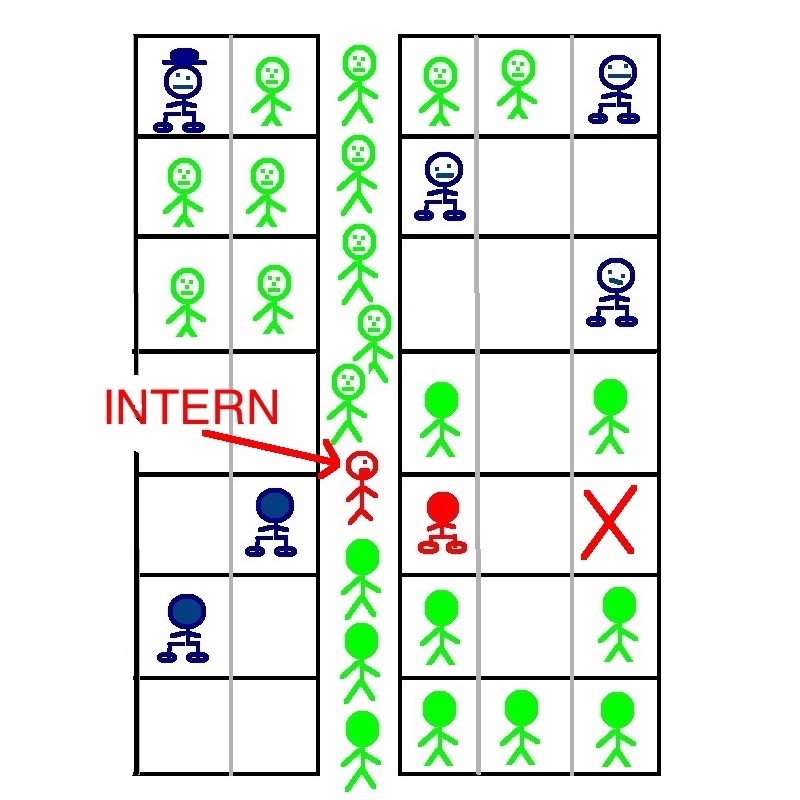 red intern wants seat "X"
People boarded from all doors. In Exhibit B, you can see the people in green taking seats and standing in the aisle. A young college-age man, depicted in red, asked me if he could sit by the window, which is marked with a red X. If it were a veteran commuter and not an intern, he would have issued a short but polite "excuse me," accompanied by a nod to the empty seat. This fellow used an entire sentence. "May I please sit by the window?" A noun and a verb. Subject and predicate. Amateur. I was about to stand and let him in, but there was nowhere for me to go. Have a look at Exhibit B again. There were people behind him and in front of him, so he couldn't get out of my way. We were deadlocked. At that point, the young man attempted to climb over me. You don't step over someone on the train. This isn't a movie theater, JACK. I don't want a face full of body parts or your bag breaking my nose. "Stop!" I said. "I'll get up for you." I gave the man behind him a short but polite "excuse me," accompanied by a nod to the small space behind him (note the application of previously described veteran commuting tactics). He and the young man stepped back, and I stepped into the newly opened aisle spot. The young man shimmied past me and sat down. I sat back down in the aisle seat. 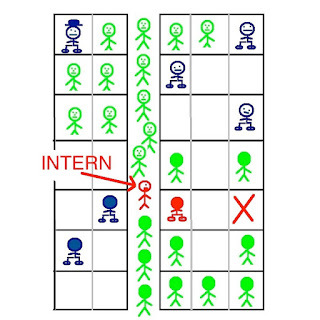 Interns, pay attention! I'm not telling these stories for my health. There will be a test at the end of the summer. I haven't decided on multiple choice, essay, a final paper, or a combination of both. Your results will make up 82.9% of your grade.